With good weather forecast, at least for most places, a good mountain walk was in order. I chose Mount Field West, a walk I have always enjoyed, if always found to require a good deal of effort. 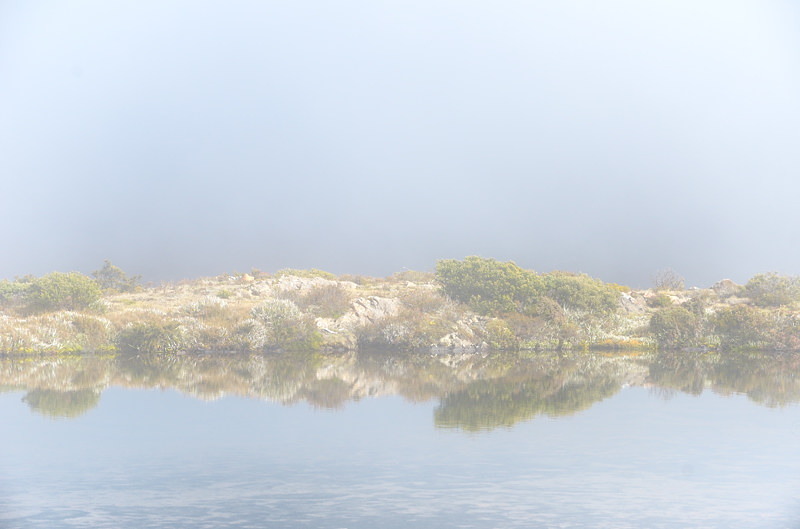 The walk is 16km and requires about 750m of climbing, including the climb back over the Rodway Range on the return. 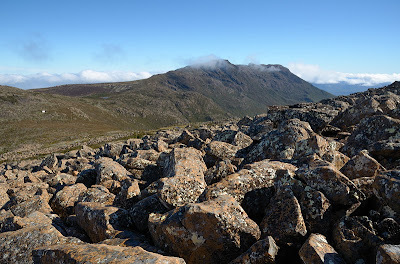 A significant portion of the walk is on boulders which require care and extra effort, and once you are beyond the Tarn Shelf turnoff, the track is mostly quite rough, even where it's not on boulders. The summit plateau at Mount Field West is lovely though, and views to the west and southwest can be terrific, Florentine Valley forestry operations notwithstanding. On this day I got pretty good views for much of the day, but the cloud came in while I was at the actual peak, so no westward views this time. Walk Description: The track is well marked for use in clear weather, but may be difficult to follow in rain and fog. Be aware that once in the vicinity of the peak, the return is over several kilometres of extremely exposed route. There are no more sheltered alternatives, although there is a very small hut at K-Col which would provide shelter in an emergency. This hut has no stove. This walk is not worth attempting in poor weather. Cloud, rain and wind should all give pause. Be prepared to alter walk plans at Lake Dobson, or even once in the vicinity of Tarn Shelf if weather conditions seem poor. You will get a taste of them on the top of the Rodway Range, and if weather there makes walking uncomfortable, be aware that this will persist for the remaining distance of the walk until you are back below the Rodways, or even until you are back below the Ski Village. The walk commences at Lake Dobson, following the track around the lake and then quite steeply up the ski lodge access road. 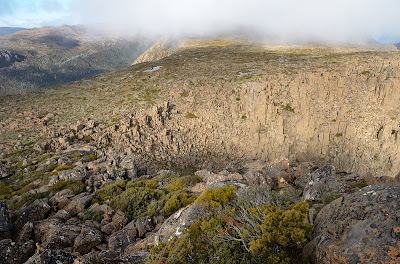 Where the first ski lodges are found, I prefer the walking track that passes in front of them and then winds up to the plateau through boulders and alpine gums. This emerges on the main board walk which heads along towards Tarn Shelf and the main bulk of the Rodway Range. 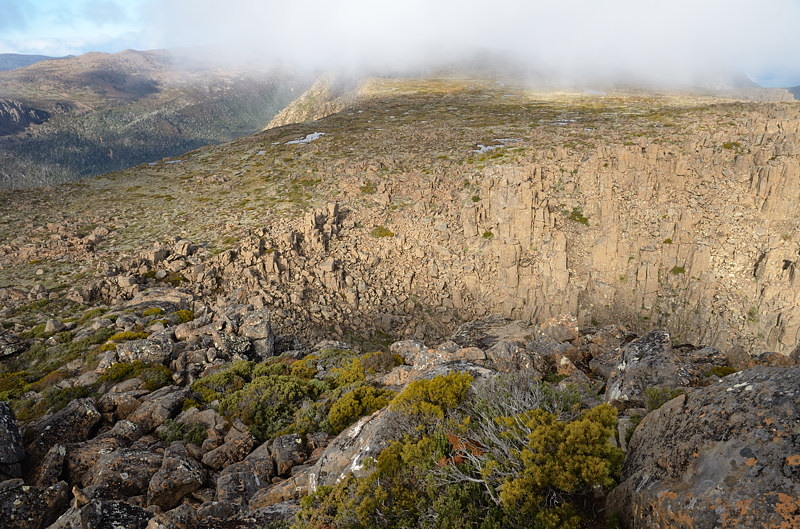 The track again climbs quite steeply onto the Rodway Range, starting a lengthy traverse on boulders. These slow progress somewhat and require greater exertion. Being somewhat unbalanced, I always find them more awkward. 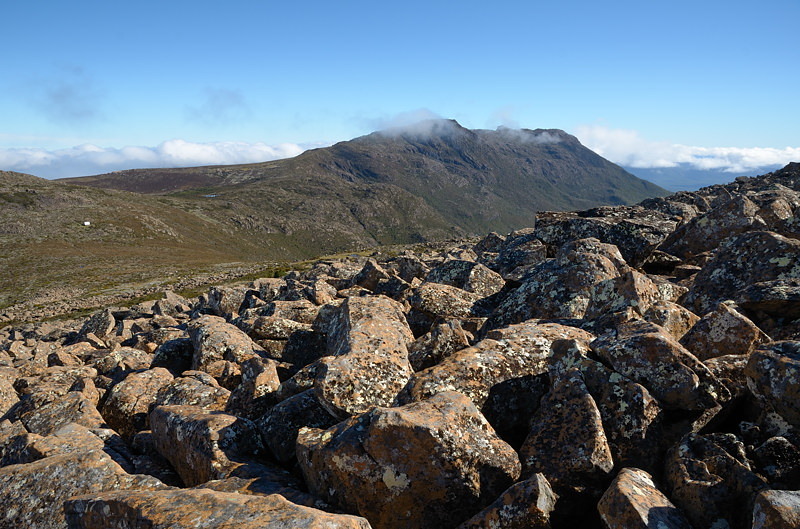 The way is marked with cairns and poles and winds along the top of the range through a depression known as The Lions Den before eventually crossing to the western side and descending towards K-Col. The hut will be clearly visible a little way up the far side of the col. K-Col is so named because of the shape of the topography - the col joins the Rodway Range to the peaks of Tyenna, Florentine, Naturaliste and Field West, making a sort-of "K" on the map. The hut used to have a water tank and coal stove, but these are no more. Possibly to discourage camping, as the hut is now clearly signed as being for emergency use only. Water can be obtained a little way beyond the hut from Clemes Tarn. I don't vouch for the quality of the water, but I didn't catch anything from it. ﻿Beyond Clemes Tarn the track climbs steadily along the ridge towards Naturaliste Peak, before passing alongside this eminence and emerging onto the large summit plateau. The pools and vegetation here are very attractive, and it is a lovely place on a sunny and clear day. The actual summit is at the top of a ramp rising to the west from the northern end of the plateau, and the track is marked across the plateau and up the ramp. There is a good sized cairn at the summit, and space to sit on flat rocks if the weather is conducive to eating lunch there. At the summit, you are 8km from the carpark, so a solid return walk including the bouldery traverse of the Rodways is required. The only variation I sometimes make to the return is to follow the boardwalk all the way to the ski village and then descend the uppermost section of road to rejoin the inward track.